It's been awhile since we've been in touch. All I can say is "it has been a busy year!" However, it is always great to put what's happening on paper (?) and to stay in touch with all of you. Eritage Resort has opened. The ten-suite luxury resort and restaurant, managed by Fire & Vine Team (El Gaucho group), opened in July and has received stunning reviews. Now work has started on the cottages around the pond. By the way, the pond is not only a fire-suppression requirement but also is used for swimming, paddle boarding etc. Hats off to Justin Wylie of Va Piano and his ten-year pursuit of this vision. He has created a game changer. 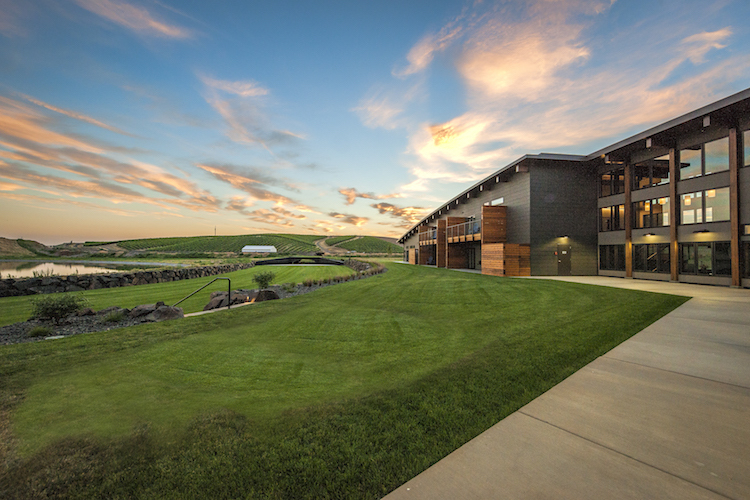 On your next visit to Walla Walla, you need to take a drive out to the resort for a cocktail or dinner and make future plans to stay in this amazing resort. Just before you get to Eritage Resort, you'll see signage for ten estate lots with stunning views of the Blues. Lots range from 1.2 - 1.92 acres and start at $155K with thoughtful CCRs. In time for Fall Release Weekend (Nov 1-4) is the much-anticipated opening of Walla Walla Steak Co and its casual partner, Crossbuck Brewery on 2nd and Pine at the train depot. We were invited to their pre-opening party and right out of the gate, we were dazzled by the level of culinary perfection and outstanding service that Chef Dan Thiessen is passionate about and the Fire & Vine Team are known for. Besides their wood-fired steaks, they make a Smoked Manhattan that is awesome and have a great list of wines by the glass as well as a well-curated wine list. Tip: If you enjoy the various lodging and dining options by the El Gaucho group (Eritage, WW Steak Co, El Gaucho, Miller's Guild, The Inn at El Gaucho, The Lakehouse,Civility's Unrest, AQUA) join their Revelers Club for benefits, perks and discounts. No cost to enroll. I joined today! Walla Walla continues to attract exciting chefs to our destination. Earlier this summer, Hattaways on Alder opened in the space that formerly housed Saffron Mediterranean Kitchen (we love their new space on 5th & Main Street). We knew that Hattaways had large shoes to fill and I can report that they have surpassed any expectations that the space may have bestowed on them. Here's how the owners, Lindsay and Chef Richard Hattaways describe their food philisophy: Inspired by the local ingredients of the Pacific Northwest, Hattaway's on Alder brings the cooking traditions of the Southeast and rural American to downtown Walla Walla. Honest food with the charm of Southern hospitality. Be sure to check out this new and important addition to Walla Walla! Look for a large project for T.Macs in 2019. Tommy is moving to the corner in a creative new space that will capitalize on his popularity as Walla Walla’s home-grown cool guy! I could keep going on the food scene and tell you about two great new pizza purveyors, one in a restaurant and the second in a wood-fired pizza truck, however, I'll leave that for the next installment. If you can’t wait, then reach out by email and I’ll fill you in. Since we closed our doors at Girasol Vineyard & Inn in late spring, life continues and it has been a glorious, albeit hot summer here. Do we miss not getting up to serve breakfast? Not a bit! However, what I do miss are those late afternoons on the patio with a glass of wine and hearing about everyone's day. However, as we have not skipped a beat picking up our lives, it seems that we were ready for this change. Edward is getting to the golf course more often. We did break ground on our new house so he is on site daily checking it out. We hope to be in the new Walla Walla home before we head to Arizona in late December however, until then we are still at Girasol and savoring our last few months here. I am enjoying real estate. The market is brisk here with a Seller's market of less three months of inventory. At the end of July, I was in Bellevue for a real estate course and heard first-hand how crazy the market is in both Seattle and Portland metro areas. Agents are talking about writing offer after offer for their clients and getting beaten out on every house. Seller agents talk of multiple offers that far exceed appraisals with no end in sight. However, the most interesting comment was that the Pacific west coast, specifically Seattle and Portland will continue to see an influx of real estate dollars, driving up property values. So this raises a question, if all these people are moving into these metro-areas, where are the current residents going to move to? It's a Catch-22. You can make beaucoup on your current home, but where will you buy next? Some of you will think of Walla Walla as a possible destination. Yes, we don't have a Nordstrom or even a Trader Joe's. However, the traffic is a breeze and we just added several new restaurants and some new places to shop on Main Street. I guarantee that you'll get out more here than you are probably doing now with great winery events such as Castillo de Feliciana's Salsa Under the Stars on Saturday, September 3 or Food Truck Night at the Incubator Wineries on Monday, Sept. 5. Something to think about. Be sure to let me know if you decide that you want to get some info on slowing down (ha!) or just more about living the good life here in Walla Walla.